I thought my motherboard was dying. I have an old Lenovo built, IBM branded desktop with 512 megs of memory and a 3 GHz processor. It runs Windows XP Pro, because the bank requires I run a piece of crap software that only speaks Windows. I’ve learned to live with it. It’s got a Pentium 4, which had heat dissipation problems, which is why I figure the folks at Lenovo installed a gee-whiz thermostat controlled fan that’ll rev-up way high when needed. Normally that hasn’t been necessary, except when I get carried away watching high def movies or spend too much time strolling down memory lane on YouTube. Recently, however, I’d noticed the fan cranking-up unexpectedly, when I wasn’t doing anything I considered to be too resource intensive. Programs would also get unresponsive, requiring me to kill them through the Device Manager. Again, I figured the motherboard was on it’s way out and that before long and be on my way to see Chris over at Dragonware to see if he could fix me up with a used Windows box so I could continue to make the bank happy. Then, the other day, after I’d ctrl-alt-deleted to bring up the task manager and close Firefox and Thunderbird the quick and rude way, I decided to investigate. I went to SourceForge and downloaded and installed Process Hacker. The cause of the problem I was having was obvious immediately; it was Firefox and Thunderbird. With all other programs closed and only one tab open in the browser, 87% of my memory was being used. With five tabs open, memory use was off the chart. I’m a writer. I often have five or more tabs open. It’s what I do. It was just a guess, but I assumed that the last few upgrades to Firefox had given me a browser that is more hungry for system resources than ever. Now that most modern computers measure memory in gigabytes instead of megabytes, the programmers are bound and determined to find a way to use them. I checked Chrome. It was just as bad. So I decided it was time to have a look at the Windows port of the FOSS browser QtWeb to see if it would suit me. Setting browser “Compatibility” in QtWeb. I installed it both on my Windows box and on my laptop running Bodhi. The Windows install was typical, using a Windows Installer. The Linux install was about as easy a Linux install as I’ve ever seen. In Linux, the browser is one file. Save it to the hard drive and either open it through a terminal or set up a link to launch it from the menu. It’s a nice browser. It’s designed to be portable; just throw it on a USB device and run it from there if you like. As the name suggests, it uses the Qt framework and, like Chrome and Safari, takes advantage of the WebKit rendering engine. It’s a very quick browser. Pages load fast and there are no problems, as far as I can see, with how it displays them. It has several cool features that might come in handy. For example, under Tools>Compatibility the user can see how a website would look under other browsers, such as Firefox, Chrome, Internet Explorer and even Safari–a useful feature to have handy when doing work on a website. The browser treads lightly as far as system resources go. With QtWeb and Thunderbird open, Process Hacker reports memory usage on my 512 MB machine at 48%. Close Thunderbird and memory use drops to 35%. Since XP alone uses 30% of the memory on this machine, this means that QtWeb is using only 5%–or about 25 megs. There are some problems, however. There doesn’t seem to be a way to make QtWeb the default browser. Not a deal breaker for me, since I always keep multiple browsers on all of my machines–so there will always be something onboard to play the default role if needed. There’s also no way to run Java, which also doesn’t bother me since I haven’t had Java enabled in a browser in ages. A more serious problem is that it doesn’t seem to want to work with some websites I use for business. When I visit our Google AdSense page, for example, the program stalls while attempting to load our latest totals. So far that’s the only problem page I’ve found, but there are sure to be others out there. The biggest deal breaker for me, as a writer, is there doesn’t seem to be a dictionary or way to install one–hence, no spellcheck. Finding this hard to believe, I decided to check-in at the QtWeb’s forums, where I discovered another problem. Attempting to go to the project’s forums returned a 404, “file not found” error. I like QtWeb. I like the fact that it doesn’t use many resources. Also, I like it’s quickness and design. What I don’t like is that it doesn’t seem to be finished yet. As soon as they get it finished, I’ll use it as my main browser. All it needs is some tweaking of it’s handling of web apps, a way to make it the default browser and a dictionary–the last being essential as far as I’m concerned. Oh, and it would be nice if they fixed whatever problem they’re having with their user forums. In the meantime, I’m still going to use it a bit. I’d just like to be able to use it more. You can’t run a Windows browser through Wine, or change your user agent on a native Linux browser and make the bank happy? You need to add it to alternatives. Do it the easy way – with a GUI. Open Synaptic. Do your updates. Look for and install galternatives package. Close Synaptic. In the menu, go to Applications > Preferences > Alternatives Configurator. After supplying the sudo password, scroll all the way to the bottom of the left panel. Select x-www-browser. Click the Add button. Browse to the executable in your home directory and select it. Click OK to add it. Click the bullet to make QtWeb the new default browser. CAPTCHA still isn’t working on first pass. Have to select a second CAPTCHA image before it will work. @djohnston Must be a problem with your browser or something. I’ve been testing both logged-in as admin and logged-out, as a visitor. I’ve also tried on several different machines with several different service providers. Right now I’m posting as a visitor for a computer thirty miles away from my office. A problem with my browser? If you mean the CAPTCHA, I don’t doubt it. I’ve been experiencing some “quirks” on certain websites with Firefox. It’s either in the settings, addons or in my hosts file. I’ll have to do some experimenting. Change the path in the Exec= line to match yours. Many technology writers praise small, independent web browsers. Reading them, you’d think all the idiots work for Mozilla, Google, Apple and Microsoft, while all the talented geeks are in the FOSS world. Wrong, of course. Have you checked whether QtWeb is functionally equivalent to Firefox? Does it have the ability to use plugins? Flash, for instance? Silverlight? I guess no. I’m using Firefox 18.0.1 on a 2005 laptop, and its memory usage is more than fine. Have you considered disabling your plugins and extensions? Having them turned off simply turns FF into a rocket, speed-wise! Oh, right now the QtWeb site is down… Great! you’re complaining that you get a 404 when you try to hit the qtweb forums… it’s NOT the fault of the qtweb browser. i get the same error on the link you posted in your article (http://qtweb.net/smf/index.php?board=1.0), and I tried firefox and chrome here. furthermore, i tried all the links that a google search for “qtweb” returns. it looks like any page you try to hit on qtweb.net returns a 404 error. so… i think it’s not the browser’s fault – the website is defective. @woolie I understand that, it’s a problem with the project’s website. This is very problematic, as a project’s forums are usually the best place for a user, especially a new one, to turn for help when is having problems or learning to use a feature on a program. With no forum, for example, I can’t determine whether there’s a way to install a dictionary or otherwise enable spell check. It also might make one wonder whether this project is still active or if the browser has been abandoned. At work I used to keep about a hundred tabs open at a time in Firefox on Win7, all loaded up and everything. System memory use stayed around 65% no matter what I did. Even if I closed Firefox, 65%. Always baffled me. Well, yesterday when I wrote this review, QtWeb had a functioning website with forums that didn’t work. Now there’s no functioning website at all. Evidently, there is no QtWeb project any longer. That’s a shame. Maybe someone will pick-up the code and continue to develop it. On further digging, I discover that the latest stable build of QtWeb was just released, evidently on January 4th of this year, so I doubt that develop has been dropped on this project. They could be having some issues with their site, perhaps security issues. @Chaz I know that Firefox works fine on modern machines with a GB or more of memory. If memory serves, a GB memory is the minimum system requirement for Windows 7, with 2 GB recommended. It’s on older machines, like my 512 MB box, where Firefox is now giving trouble. A year or so ago, the latest and greatest Firefox worked fine on this box. It still works (just) OK, if I don’t open too many tabs and close the browser and reopen every half hour or so if I’ve been loading a lot of different sites, especially if they’re script heavy pages. Don’t get me wrong. Both Chrome and Firefox are great browsers. There’s just no reason for the creeping memory use with each new release that makes older machines obsolete before their time. Not from a browser. Nice post, Chris. I’d never heard of QtWeb, so I just gave it a go and installed it. I works pretty nice; very comparable to Midori, which is also WebKit based. Have you tried that one? It’s a little bit more mature with more plugins and options than QtWeb seems to have. @ Benjamin – Actually, I’m writing this in Midori. I run Bodhi Linux on my laptop and Midori is the default browser in Bodhi. I was just trying our Qupzilla, which I liked a lot. Then it crashed on me twice on my Windows box, then it crashed on me again, here on this Linux machine. By the way, since I posted the QtWeb review on Thursday, their website seems to have been taken down. It’s beginning to seem to me that the QtWeb project is no more, so I wouldn’t fall in love with the browser if I was you. It’s beginning to look like it’s now an orphan with no support. Good news! QtWeb’s website is back up, so evidently they were just experiencing some problems with the site. Their forums still aren’t operating, but I guess we can scratch this off our list of abandoned projects. I noticed that the current QtWeb version is from 2010. Not good. Most bugs are not fixed, even if they are old. 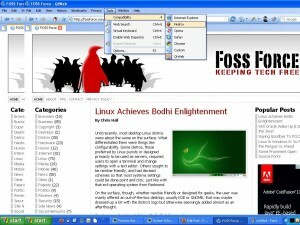 The comparison with other browsers is from November 2009. Qt is said to belong to Nokia, when in reality it was bought by Digia in August 2012. To me all this suggest a moribund project, one of those maaaaany browsers that try to save the world but just die in 3-4 years. I wouldn’t bet my money on it. Plus, I don’t believe in free lunches: if FireFox is 25Mb large, and QtWeb only 6Mb, I strongly doubt the two are functionally equivalent. 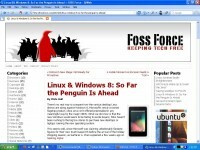 Being free software, why hasn’t it been adopted by the Linux community (where there’s rekonq)? Being so fast and small, how come it doesn’t get adopted more? Something is fishy here. @A. I agree with you that it looks like this is a dead project, and for security reasons alone, people should probably think twice before using this. However, this browser is still included in the software repositories of several Linux distros. I think you should understand, though, A. that when many of us are looking for a small, lightweight browser, we’re not necessarily looking for the same functionality as, say, Firefox. 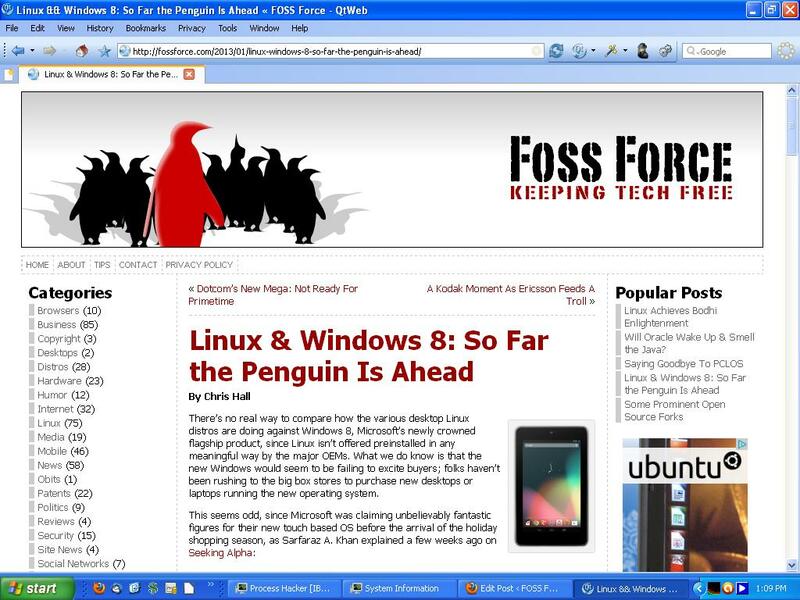 There are several lightweight browsers available in Linux, that actually compare quite favorably to Firefox, that use much fewer system resources and are secure. The default browser in Bodhi Linux, and a few other distros, is Midori, which is tiny and lightening fast compared to Firefox. It is true that occasionally it won’t handle the apps on a particular page–in that case I open Firefox and get the job done. But for day to day browsing, when in Linux I stick with the lightweight Midori because it’s faster and uses much fewer system resources.